Garmin iQue 3600 has been discontinued. The Garmin iQue 3600 is a more intelligent way to get through your busy day. 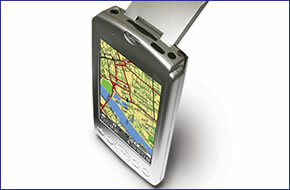 Organiser functions you rely on, including calendar, contacts, to-do-lists and memo pad are integrated with GPS satellite navigation caspabilities. The multiple functions of the Garmin iQue 3600 allow the user to be reminded of an appointment, view the appointment on a electronic map and get turn-by-turn directions, with voice prompts to the specific destination. All while listening to music on the MP3 player or dictating messages on the recorder. The Garmin iQue 3600 is thus a unique way of navigating your busy day to get the most out of life. The Garmin iQue 3600 includes an organiser including Calendar, contacts, to-do-list and memo pad. The calendar feature shows appointments and sounds a reminder when appointment draws near. Then the iQue 3600 really comes to life, simply flip up the GPS antenna and enjoy on screen directions and voice prompts to your destination. The Garmin iQue 3600 includes a built-in speaker for voice-guidance commands, playback of the integrated MP3 player, and dictated messages. The Garmin iQue 3600 can also be used in-car to provide an automotive navigation solution. Do you have a question about the Garmin iQue 3600 or other handheld GPS related question that's not been answered on this webpage? Please see our handheld and Outdoor GPS FAQs page for questions from other customers.Plus if the answer to your question isn't featured, use the online form to ask us for the answer. Alternatively please telephone 01733 777623 Monday to Friday (9:30am-5:00pm) to speak to one of our sales team. The Garmin iQue 3600, relies upon a rechargeable internal Lithium-ion battery that can be charged either in the cradle or while connected to the power adapter. In addition the Garmin iQue 3600 can also be powered by the provided mains A/C power adaptor for use in the home or office, when updating map detail or configuring a route.